Allow me to chime in on something I knew nothing about until last night...this is the internet, after all, where people make a living spouting opinions disguised as fact. The topic is that Bandai Entertainment will be ceasing distribution of anime and manga in North America, and what it means to the rest of us. First off, I'd like to say that I don't follow the anime and manga scene much, especially not in America. But I was a pretty big otaku back in the 1990s, so I was there for the anime boom. I was there for the beginning of fansubs appearing on the internet, and I was personally instrumental in the price of dojinshi skyrocketing on eBay. When I got into anime, Project A-ko had just been released in the States. That puts the time period at around 1993. At that time, if you wanted anime you had very few options. You could buy the stuff that was released commercially, but it was very limited in scope and releases were few and far between, and even if something was released sometimes it could be a pain finding what you were looking for. Anime was carried by Suncoast Motion Picture Company and independent comic book stores. Your only other option was to get anime that had been translated and subtitled by fans. In order to get those you first had to find a place that distributed them; ads for these could usually be found in the backs of magazines like Mangajin (at least, that's where I got my information). Once you found a place, you had to send off for a catalog, which were just laundry lists of titles xeroxed and stapled in the corner. Usually how it worked was one tape was $4.00. Each tape could hold 120 minutes of programming, and you could pick up to 4 titles per tape up to a maximum of 4 tapes. You'd pick your titles, fill out the form, get a money order, fill out return address labels, send it all off and then wait for the tapes to arrive. The unwritten rule at the time was, once a title was picked up for domestic distribution, it was taken out of circulation by the fansubbers. Fansubbing was really a labor of love back then. At $4 a tape, no one was really making money off the deal, and the fansub community would get pissed at stores that would order fansubs and then sell them for profit. ADV Films got its start selling fansubs for a profit. Then came the dawn of the internet. Back then we had something called "dial up". It took forever to download anything. I mean forever. One day I stumbled upon some information that you could download fansubbed anime. That was a new concept at the time. Turns out that a digital anime distribution service was being run off the back of a major video game website's servers. You had to have the specific IP and a password. Once you were in, the sky was the limit. It was a real revelation in quality. The unwritten rule at the time was, once a title was picked up for domestic distribution, it was taken out of circulation by the fansubbers. See, VHS and even SVHS fansubs were usually two or three generation copies, so the quality could be described as iffy at best. These were crystal clear (for the time) and people were posting shows the same week they aired in Japan. It was a sea change for anime fans. At the time I don't think anyone thought this could have any negative effects on the industry. It seemed that the unified mindset was that the more exposure anime got, the greater its popularity would be and the more it would become available. Looking back, it was a very selfish way of thinking; but nobody could have predicted the way the internet would explode over the coming decade and how media would shape the face of the world wide web. The dream of fans of Japanese animation and manga was that it would become an accepted thing in America, easy to get at a reasonable price. 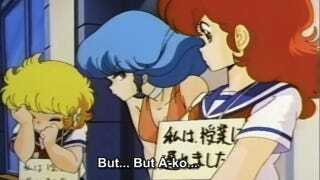 Remember Project A-ko? I had to work all summer to be able to afford that VHS tape—it cost $40.00. The digital distribution of fansubs didn't really increase awareness of the genre. Mainstream exposure on popular television networks did that. What digital distribution did do was create a beast that demanded that content be available on demand, without cost. It created a situation where fans no longer supported the actual companies and the people who worked to secure rights, translate, redesign packaging, and get it to market. Why pay for something when you could get the same product with pristine quality for free on your computer? So what if it was just a digital file? If you wanted to, you just create a compilation DVD. Many American anime distribution companies have come and gone since 1993: Animeigo, US Renditions, US Manga Corps, and others. Now Bandai Entertainment joins the list. But the shuttering of Bandai offers a little more insight into the fragility of the anime market in America right now and we can expand that to reflect on the market for entertainment as a whole, including video games, movies, and music. You see, Bandai Entertainment was more than just a redistributor of content, they were a content creator, and as a content creator myself through Happy Chicken Group and Studio Happy Chicken, I totally get where they're coming from. Digital distribution, or piracy as it should be more accurately called, is destroying the entertainment industry. The fallacy that most fans follow is that media companies are the giant, evil corporations hell-bent on sucking every last dime from the consumer while giving them little or nothing in return, and that's just not true. I don't think fans realize how expensive it is to create professional media. Let me break it down for you a little bit. To create an original anime, someone has to come up with a scenario and write a script. This script has to be edited and then each action and scene is drawn out individually as storyboards. Animators have to draw the major action in the anime, and then separate people called in-betweeners come in and add more movement to the animation. Finishers then take this rough animation and trace it so that rough pencil sketches become smooth lines. In today's world these finished scenes are scanned into a computer one by one and then individually colored. When I started watching anime the rough sketches were traced over to acetate and painted by hand. Voice actors watch the animation and read the script providing the voices of the characters. Backgrounds have to be painted. A separate group of people called folly artists record sound effects. A composer writes the music and then records it with a hired band or orchestra. The voices, sound effects, and music are then synched with the action. It's then reviewed and edited down to fit a certain time frame. A lot of time and money has already been spent, and the final product still isn't out the door yet. Packages and package inserts have to be designed, the animation has to be mastered and sent off for replication, and then the finished product has to be shipped to the distributor who sends it to stores. Still more artwork has to be created and magazine ads and posters have to be designed so that people know the product exists. All of that is just to get the anime out in Japan. To release it in America, licensing rights have to be negotiated, packages redesigned, the entire script has to be translated and re-written; then re-timed and re-recorded by English speaking voice actors. Subtitles have to be written and timed to match what's happening on the screen. Then the product has to be re-mastered again and sent to a manufacturer again so it can be sent to a different distributor that can get it into stores. It's a lengthy and costly process. Video game production is very similar, but scripts are infinitely more vast than that of anime. It's actually more costly to translate and re-release a video game in North America than an animated title. From comments I read on the internet, it seems that fans believe that the entertainment products they hold so dear just spring into existence with the wave of the hand of a Hideki Anno, Shigeru Miyamoto, or Keiji Inafune. Consumers have become selfish monsters who are strangling an industry that is already on its knees. Just because something is called a multi-billion dollar industry in the press doesn't mean that the people involved in making things are all rich. Every year in Japan more and more manga artists, animators, directors, and game designers are hanging up their hats because they can't make ends meet. More often than not these new faces will continue to feed on free pirated content because that's how they were turned on to it in the first place. Bandai Entertainment isn't going out of business. They're a pretty big company and have a market far beyond that of the United States; but their actions do serve as a red flag as to what's on the horizon unless the fan community stops it's selfish and destructive behavior. If we examine the actions of the last 20 years, and put our own selfish desires to the side we can see that the only thing fan translated anime, manga, and games serve to advance is our own desire of want. It does not help the industry, it does not call positive attention to our hobbies, and while it may attract a small number of new consumers, more often than not these new faces will continue to feed on free pirated content because that's how they were turned on to it in the first place. People gnash their teeth and moan about the SOPA legislation that is snaking its way through the American Congress, but we have no one to blame for this but ourselves. We created the beast, and we continue to feed it. We've reached the point that it's not uncommon for major websites to publish links to pirated content. Pirating has gone mainstream, and unless we as consumers have the fortitude to reverse our actions, allow the market to work as it should, and develop the patience to wait for new products to become available in our region, or even not become available, the face of the internet and digital media will change. It's inevitable. Charlie Maib is the force behind pink movie company, Studio Happy Chicken , best known for its forthcoming Catherine parody. Follow Charlie on Twitter at @HCKPink Republished with permission.